All core Easy Social Share Buttons for WordPress features will work without plugin activation. The activation will give you an access to features like automatic updates, extensions installation, multilangual translate, read made styles library. The activation of Easy Social Share Buttons for WordPress requires a valid purchase code for Easy Social Share Buttons for WordPress. If you receive plugin bundled inside theme you cannot activate plugin with the theme purchase code. The version of plugin you are using when receiving plugin with theme is theme integrated. The theme integrated version will not receive updates of plugin together with theme releases. 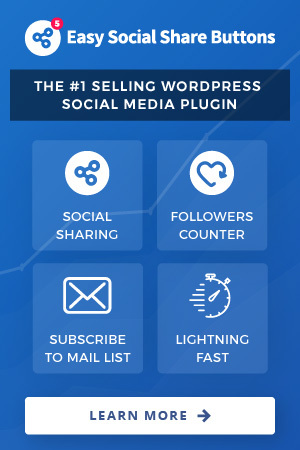 If you have a theme integrated version of plugin but you need to get access to all premium benefits: automatic updates, direct plugin support from author, access to extensions, ready made styles you need to purchase a direct copy of Easy Social Share Buttons for WordPress.